Lyric websites have been a staple of music-related search results since the start of the millenium, but the format of presenting lyrics on many of these sites has remained mainly the same since their inception: plain text with no supplementary information or interactivity. Perhaps the most notable innovator in the genre is Genius — formerly known as Rap Genius, the site’s sidebar annotations now extend to multiple genres and even outside the music sphere to news and entertainment, and infrastructure to help “annotate any page on the Internet” is currently in beta. Google recently began showing lyrics in their search result pages as part of their Knowledge Graph, but beyond requiring a click through to the song available for purchase in their Google Play store for access to the full lyrics, their method of displaying lyrics is no more advanced. Even despite sidebar-comment approaches similar to Genius in other industries, including notes on content platform Medium and annotations on Quartz articles, most lyrics-dedicated sites have been stagnant and unimaginative. In the fast-paced online environment where rumors fly almost daily about new music releases, it is nice to have an official source to back rumors about upcoming album or single releases. Unbeknownst to many, iTunes has a useful fact-checking source in its own Link Maker. The Link Maker is intended for affiliates to create links to products within the iTunes Store; purchases made through these links provide affiliate sales to the creator of the link, providing they are a member of their affiliate program. Since the Link Maker can show links to products within the iTunes database, searching on the Link Maker can be used as a legitimacy check if a new release is in the iTunes database. I previously covered this search ability as a method of fact-checking the name of Justin Timberlake’s single “Suit & Tie,” and now I would like to highlight its usefulness in order to analyze the rumored tracklisting for Kanye West’s upcoming album, Yeezus, slated for release on June 18. Even if a song or album is not yet available to purchase or pre-order on iTunes itself, if a release is in the iTunes database, the artist will appear in search results for the song or album name. As noted in the aforementioned Justin Timberlake post, once the single was rumored to be titled “Suit & Tie,” I was able to confirm the title and the Jay-Z feature by using a search query like “suit & tie feat jay-z” even before the name had been confirmed. Similarly, when rumors rose that the upcoming Kanye West album would be named Yeezus, I checked the Link Maker to confirm that the name was legitimate. Recently, as reported by Beats Per Minute, screenshots have appeared online suggesting the leaked tracklisting of Yeezus, with featured artists including Frank Ocean, Tyler the Creator, and John Legend. Since the tracklisting was posted as a screenshot of an iTunes pre-order page, I checked to see if the titles appeared in the Link Maker. While “yeezus” still brought up Kanye’s artist link, the songs did not, simply showing instead that “Your search had no results.” For example, a search for “new slaves frank” reveals two unrelated matches, while “new slaves feat frank ocean” delivers none. The results are the same for other combinations, including “kanye lightning,” “yeezus awake with the dark,” and “kanye lonne chia.” If the tracklisting were correct and currently in the iTunes database, all of these search queries would have shown Kanye West in the artist links. Even the previously-confirmed tracks, “New Slaves” and “Black Skinhead,” produce the “Your search had no results.” message. Notably (and perhaps a piece of evidence that would further debunk the rumor), there are search results that do connect themselves to the Yeezus tracklisting. As iTunes has shown with previous pre-orders, such as One Direction’s Take Me Home and Daft Punk’s Random Access Memories – both of which were available to pre-order on iTunes before the tracklisting was revealed – tracks without released names are listed with the word “Track” and a number, such as “Track 1.” Searching such queries as “yeezus track 1” through “yeezus track 14” pulls the Kanye West artist listing, but “yeezus track 15” does not. Not only does this suggest that Yeezus will have fourteen tracks, as is shown in the rumored pre-order, but it shows that the temporary titles of the songs in the iTunes database have not yet been replaced. One final note: in the two images with the leaked tracklisting that I have seen thus far, the prices for the songs and the album are shown in pounds, not US dollars. In order to confirm that this was not just an absence from the US store, I searched in the Link Maker for UK results as well, with no changes in results. Even if the Yeezus tracklisting is revealed to match the leaked images, I am not yet convinced of its legitimacy without any additional confirmation from the iTunes Link Maker. 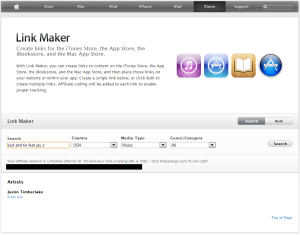 Regardless, I have found the iTunes Link Maker to be a useful source not only for creating affiliate links, but to confirm information, and I hope that this post sheds some light as to why.